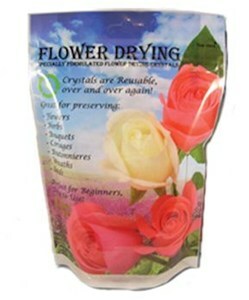 These specially formulated silica gel crystals are made for flower drying and can be used over and over again. Easily preserve bouquets, herbs, flowers, wreaths, boutonnieres and more. Great for making craft items, wall decorations, centerpieces and more. Instructions: Select a container with a lid big enough to hold your flowers. Pour a layer of silica gel into the bottom of the container and spread evenly. Arrange your flowers on top of the silica gel crystals. Gently place remaining silica gel on top of the flowers. Cover the container and let sit for several days (up to a week) to get the items thoroughly dried. Once flowers are dry, carefully brush off the Flower Drying Crystals and remove flowers from the container. Reactivation Instructions to Reuse Silica Gel: To dry silica gel crystals remove debris and place on an oven safe pan at 250 degrees F for 60 minutes in the oven. Let the crystals cool briefly and they will be ready to use again. Store silica gel crystals in an air-tight container when not in use.